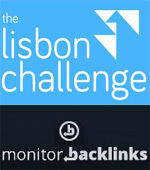 75 tech startups are selected for the Lisbon Challenge acceleration program in Portugal and the Romanian tech startup Monitor Backlinks (profiled here) is one them. The founder, Razvan Girmacea, will be moving to Lisbon on 28 of August where he will begin a 4 months intensive program. He will meet with 200 international mentors and investors and the beauty of this program is that no equity is taken from the startups. All startups will be given free office space, low cost accommodation, heavily discounted flights and visa help if necessary. As those 4 months pass some startups will be eliminated (by a jury) and in the end only 10 will remain. Those 10 winner startups will share a 150,000 euros prize (about $198,000) and will be allowed also to participate at Investor Days in London, Sao Paulo and Lisbon. They will also get free office space in Lisbon up to 30 years (hopefully, they won’t need that after several years). Monitor Backlinks was one of the finalists of the Startup Spotlight startups competition (affiliated with How to Web conference) and recently got a 50,000 Euros ($66,000) angel investment from SOS Ventures (through the venture partner Bill Liao). Lisbon was recently declared the 5th International Startup Hubs to Watch by the Entrepreneur magazine. CallerQ.com, another Romanian startup, was also selected for this program. Splinter.me (profiled here) was also accepted there. Eventya.eu (profiled here) is yet another one in this program. There are other two startups which got selected, 123dressme (Netherlands) and Gameleon (Bulgaria), representing other countries but they have Romanian founders.